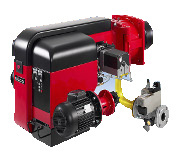 Junior Pro is manufactured in five different models, covering a capacity range of 17 to 77 kW. Junior Pro is modern both in outlook and technology. High precision of the burner head and precise air adjustment ensure excellent combustion and high efficiency. Fuel is light fuel oil, with viscosity of 4…6 cSt/+20 oC. Preheating of the oil to 70 deg. C (model L) ensures that combustion is as clean as possible. High blower pressure guarantees gentle and secure ignition in all conditions. 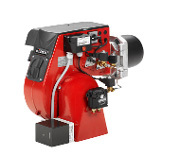 Junior Pro is designed for easy maintenance, parts are easy to access and components are well known high quality brands.Junior Pro oil burners are manufactured according to European standards EN 267 and EN 230. 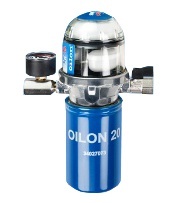 Oilon Junior Gas burner is designed for heating of domestic houses and for hot air generators. Gas can be natural gas or LPG. Junior Gas burner is reliable and designed for high efficiency, low emissions and easy maintenance. Junior Gas burners are manufactured according to European Union norm EN 676 and are type tested, equipped with CE-marking. 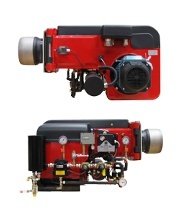 Burners in series 6 – 26 are monoblock type fully automatic light oil, gas or dual fuel burners. Capacity regulation possibilities are one stage or two stage (H). 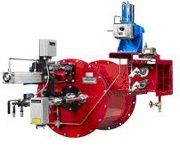 To a gas burner you can also choose a sliding two stage capacity regulation (P) or modulating capacity regulation (P). Capacity range 45 - 400 kW. Control panel is integrated to the burner. 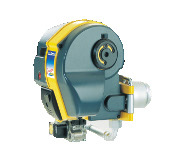 Burners in series 50 – 90 are monoblock type fully automatic light oil, gas or dual fuel burners. Capacity regulation is two stage (H). To a gas burner you can also choose a sliding two stage capacity regulation (P) or modulating capacity regulation (P). Capacity range 200 - 1.540 kW. Control panel is integrated to the burner. 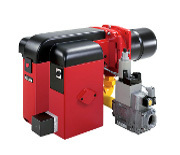 Burners in series 130 – 280 are monoblock type fully automatic light oil, heavy oil, gas or dual fuel burners. Capacity regulation possibilities are two stage (H), three stage (T) or modulating (M). Capacity range 355 - 3.500 kW. Control panel is integrated to the burner. 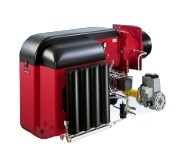 Burners in series 300 – 700 are monoblock type fully automatic light oil, heavy oil, gas or dual fuel burners. Capacity regulation possibilities are three stage (T) or modulating (M). Capacity range 770 - 9.700 kW. These burners are equipped with separate control panel*. 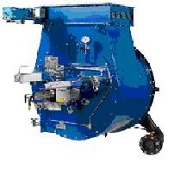 Burners in series 800 - 2000 ME are fully automatic light oil, heavy oil, gas or dual fuel burners. Capacity regulation is modulating (M). Capacity range 2.000 - 22.500 kW. These burners are equipped with separate control panel*, pressure increasing unit* and combustion air fan*. 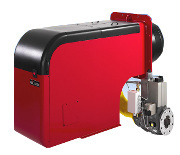 Lenox is designed for power plant boilers fulfilling the stringent emission requirements. This achievement of technology is based on staged combustion. Fuel is lead into different zones of the flame. Combustion air is divided into individually controlled chambers in wind box and directed also in stages to the flame. These fuel and air flows cause optimal air envelopes inside and around the flame resulting in long residence time and low emissions. If the requirements of emission levels are very demanding, flue gas recirculation is an option to Lenox. S-burner is typically used in hot water and steam boilers, but is suitable also in various further applications. The amount and ratio of primary and secondary air can be adjusted. Secondary air is guided through adjustable air vanes, which enables the formation of the desired flame shape and thus matching optimally to the furnace dimensions. Additionally, the adjustability contributes to achieving the required emission levels in different furnace sizes and forms. By request, S-burner is capable to be provided with single or dual-fuel liquid lance, gas lance and gas ring. K-burner is the right choice for many different types of industrial processes, for example in hazardous waste and municipal waste incineration plants. The combustion air inlet is located eccentric on one side of the burner guiding the combustion air tangentially to the wind box, which causes a strong swirl and stable flame. 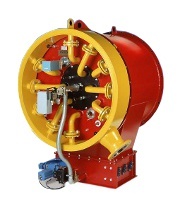 The burner construction is designed for heavy duty operation to guarantee good availability in extreme process conditions. K-burner can be equipped with several lances according to the number of different fuels. Lance burner presents technology to different demanding industrial purposes, for example as start-up and support burner in fluidized bed boilers. It is essential, that the parts will tolerate the effects of the sand bed. This is achieved in lance burner by optimized cleaning and cooling air flow through the burner. When the burner is stand-by, the critical parts will be retracted automatically. 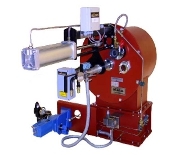 The small diameter of the lance burner allows to minimize burner openings on the boiler walls. 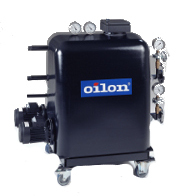 Oilon Marine Burners Since year 1963. Oilon Plus de-aerator makes it possible to use environmentally safe one-pipe system between the oil tank and the burner. Oilon Plus saves the burner and decreases the need for cleaning and maintenance..
Oilon Plus de-aerator reduces burner faults caused by air bubbles and didt particles coming from the tank on pipeline. One-pipe system is highly recommended between the tank and the burner. Oilon flow is nice and steady in one-pipe system since only the amount that is needed for burning is sucked from the tank. oil circulates between the de-aerator and the pump and it is not returned to tank as in two-pipe system. Filters, pumps and preheaters inside isolated unit. Ensure trouble-free operation of your oil burner with correctly designed pumping unit. the unit takes care of rough filtering and preheating of oil, and equipped with extra accessories, it can also take care of the right temperature and pressure of the oil. Oil filters with large filtering area improve operation safety and reduce need of service. They can be opened and cleaned easily. the units have welded plate heat exchanger, where the plates are made of corrugated, acid-proof steel. The units in R series are meant to be used mainly in oil heating plants equipped with pressure atomizing burners. In addition to the units in R series we manufacture units, where the heat exchanger operates with low or high-pressure steam. Units for higher output we manufacture according to customer’s desires.